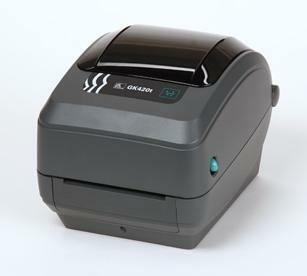 The Zebra GX model is best in class with the widest range of features in a desktop thermal printer. It delivers even faster first-label-out and, at 6 inches per second, offers the fastest desktop printer speed on the market. More connectivity choices—USB/serial/parallel, 10/100 Ethernet, and wireless—ensure easy system integration. An LCD panel, included with wireless options, displays prompts and wireless status. GK420t DT/TT 4.09" .75" - 4.25" 203 5 IPS 5" .5", 1", 1.5"
GK420d DT 4.09" .75" - 4.25" 203 5 IPS 5" .5", 1", 1.5"